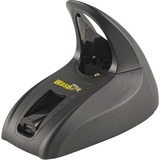 Grab another charger for your WWS800 Freedom Scanner so it's sure to stay charged when you're really on the move. Put the chargers in different locations, or bring one on site so you can charge it immediately. This charger has a radio.